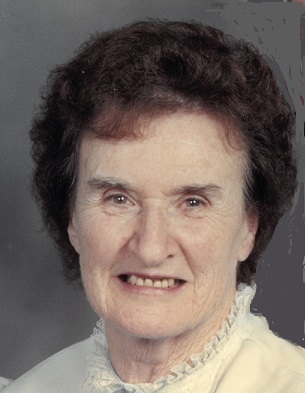 NIAGARA, Wis. — Luella “Lola” A. Tappy, 91, of Niagara, passed away Friday, Feb. 8, 2019, at Maryhill Manor, Niagara. She was born Jan. 16, 1928, in Niagara to Oliver and Angeline (Renguette) Betters. Lola grew up in Niagara and graduated from Niagara High School, Class of 1946. She was married to Arthur Tappy for 59 years until his death in 2016. Lola worked as a dental office assistant for Dr. Tobin for many years. Lola was a member of St. Anthony Catholic Church. She enjoyed bowling, going to the casino, baking, gardening, selling Christmas trees at Tappy’s Tree Farm for many years and, most importantly, spending time with her family and especially her grandchildren who were the light of her life. Lola is survived by three sons, Paul (Tina) Tappy of Wisconsin Rapids, Wis., Ken (Lori) Tappy of Iron Mountain and Bob Tappy of Niagara; four grandchildren, Ryan (Autumn Haden) Tappy of Ishpeming, Kendra (Matt) Markworth of Fargo, N.D., Deanna (Matt) Balkum of West Bend, Wis., and Monte (Ruby Fox) Tappy of Niagara; and seven great-grandchildren, Spencer, Evelyn, Brooke, Sarah, Hannah, Taylor and Alayna; one brother, Larry (Dixie) Betters; one sister-in-law, Judy Tappy; and many nieces and nephews. In addition to her parents and husband, she was preceded in death by two sisters, Mae and Irene; and one brother, Alvin. A memorial gathering will be from noon to 2 p.m. Monday, Feb. 11, at St. Anthony Parish Hall. Prayers will be recited by LeRoy Gardepy, chairman of the Living Hope Bible Church, at 2 p.m. at the parish hall. Burial will be at Niagara Cemetery in the spring. You may leave a condolence or tribute to Lola’s family online at www.JacobsFuneralHomes.com. The family has chosen Jacobs Funeral Home, Niagara Chapel, to honor Lola’s legacy of life.